In Incidents 005 a girl looks at us from the passenger window of a 1970s shooting-brake. With her hand to her head she holds an uncertain pose, a puzzlement of fashion affection and consternation. Henry Wessel’s title doesn’t give much away – an incident, something occurred, Wessel was there, he took a photograph and here it is. Now it’s down to us. 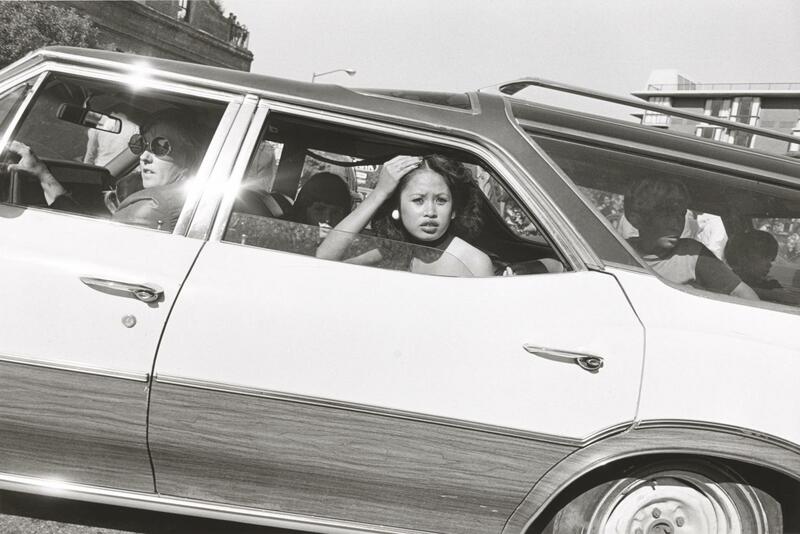 Wessel first came to prominence in William Jenkins’ seminal exhibition New Topographics in 1975, bringing together ten photographers chronicling the mundane landscapes of the suburban world. Wessel has continued photographing (Tri-X film on a Leica with a 28mm lens) the landscapes and people of California and the West Coast, walking the streets or from the window of his car. His soft, low contrast prints highlight the brilliant quality of the light in which everything can be seen, every surface described. Looking for meaning in a photograph there is much we might consider: the photographed event, the photographer, title and text, but Wessel suggests that meaning arises from a different event – from the play between the appearance of the photograph and the viewer’s experiential knowledge and imagination. Incidents 005 is currently on show at Tate Modern, London in Incidents, a series of 27 black and white prints by Henry Wessel. Thank you introducing me to Wessel’s work, and for thought-provoking comments on past, present, future. I am also interested in this familiar aesthetic of 1970s black and white photography of cars, reminiscent of Lee Friedlander. To compare these with what might be an English 70s black and white aesthetic, in an arbitrary way I looked at Hannah Starkey’s selection from the 70s and 80s Arts Council photographic collection (in the ‘History is Now’ exhibition currently at the Hayward in London). Here there are themes about ‘poverty’ and ‘politics’ – a different inflection from the US aesthetic? See for example, David Chadwick 1976 ‘A woman on a Hulme Walkway, Manchester';Chris Fillip ‘Youth, Jarrow 1976; Paul Trevor ‘Haigh Heights’ and the Hackney Flashers material. [can’t seem to show images here but easy to find]. And what do we mean by ‘aesthetic’? Are we looking for something original within a familiar trope?